See in Glossary to use, and controls when and how to blend and transition between them. 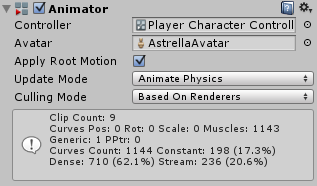 The Animator component with a controller and avatar assigned. Controller The animator controller attached to this character. Apply Root Motion Should we control the character’s position and rotation from the animation itself or from script. Update Mode This allows you to select when the Animator updates, and which timescale it should use. See in Glossary The animator is updated in-sync with the Update call, and the animator’s speed matches the current timescale. If the timescale is slowed, animations will slow down to match. See in Glossary objects around. Unscaled Time The animator is updated in-sync with the Update call, but the animator’s speed ignores the current timescale and animates at 100% speed regardless. This is useful for animating a GUI system at normal speed while using modified timescales for special effects or to pause gameplay. Culling Mode Culling mode you can choose for animations. Always Animate Always animate, don’t do culling even when offscreen. Cull Update Transforms Retarget, IK and write of Transforms are disabled when renderers are not visible. Cull Completely Animation is completely disabled when renderers are not visible. The information box at the bottom of the Animator component provides you with a breakdown of the data being used in all the clips used by the Animator Controller. See in Glossary system, or other animated values within the clip such as a changing material colour. Clip Count The total number of animation clips used by the animator controller assigned to this Animator. See in Glossary, you mave have unnecessary animation curves in your animation files. See in Glossary position and rotation animation. Generic The number of numeric (float) curves used by the animator to animate other properties such as material colour. Constant The number of animation curves that are optimised as constant (unchanging) values. 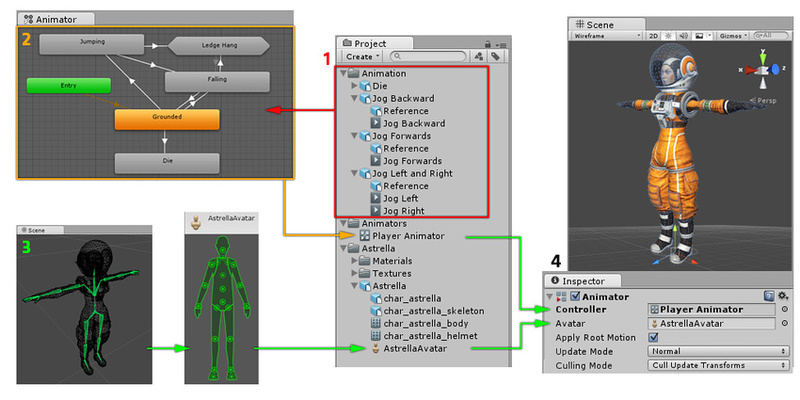 Unity selects this automatically if your animation files contain curves with unchanging values. Dense The number of animation curves that are optimised using the “dense” method of storing data (discrete values which are interpolated between linearly). This method uses less significantly less memory than the “stream” method. Stream The number of animation curves using the “stream” method of storing data (values with time and tangent data for curved interpolation). This data occupies significantly more memory than the “dense” method. See in Glossary” set to “Optimal” in the Animation import reference, Unity will use a heuristic algorithm to determine whether it is best to use the dense or stream method to store the data for each curve.